When to start is a factor of how much snow you want to hike on and how fast you are willing/able to hike. Starting early means more residual snow in the Cascades, and starting late means possible new snow in the Sierras. A southbounder should aim to be out of the High Sierra (1920 miles south of the Canadian border, or 730 miles north of the US-Mexico border) by the end of September, or be prepared for winter conditions. A July 1 start gives you ~90 days, requiring an average of 21.3 miles/day to get through. I started hiking on June 28, with the 2015-16 winter being an average snow year in the Cascades, but a warmer than average May/June. Snow was present mostly above ~6,000'. Rarely did I have to hike through snow continuously for more than a few hundred feet, but navigating on some of the higher passes took a little extra time. With 16 hours of daylight I was never in a rush. I averaged 19.2 miles/day in Washington, which includes 2 zero days, and arrived to Cascade Locks on July 24. Much of Oregon is easier hiking, so you can expect your pace to increase there. Northern CA has some tougher sections north of Interstate 5, but then similar to OR to the Sierras, where the terrain gets more challenging (and beautiful). Overall I averaged 21.2 miles/day, which included ample time to visit friends and rest (16 zero days). I passed through Kennedy Meadows (mile ~704) on September 30. If you are confident you can hike a similar pace a start around July 1 should do the trick. A faster hiker could afford a later start and deal with less snow, and maybe fewer bugs. A slower hiker could start earlier, but will likely be dealing with more snow. For the latter, flipping, starting northbound from Cascade Locks and then hitching back to hike south, is a good option to extend the hiking window a week or two. I started my hike at the East Bank Trailhead, accessing the PCT via the Pacific Northwest Trail. From the East Bank Trailhead, the PNWT goes north along Ross Lake and then east on the Devil's Dome Trail to Holman Pass, where it intersects with the PCT. This route is about 30 miles to the PCT with a good climb up from Ross Lake. Holman Pass is 17 miles south of the northern PCT terminus and 44.4 miles north of Rainy Pass at Hwy 20. The Devil's Dome trail had some down trees and overgrowth, as is to be expected early in the season, but it was very much passable and a beautiful way to get started. 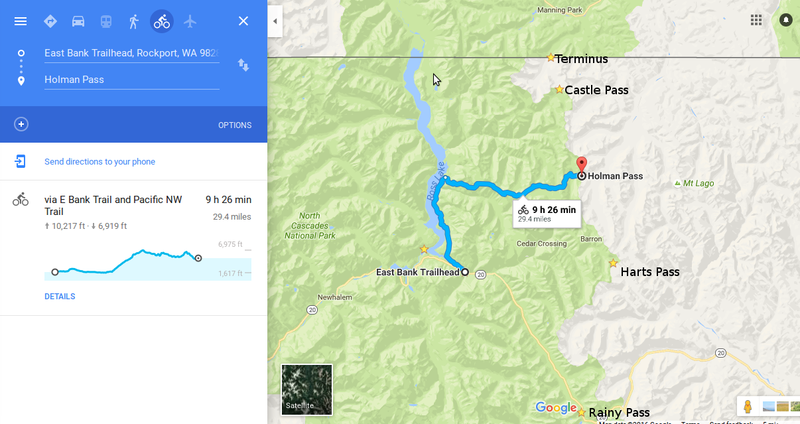 I made the mistake of not going up to the northern terminus and back from Holman Pass. When planning I was unsure how far I could hike per day, how much snow I'd hit, and if I'd be able to carry enough food. I was overly cautious, as I had plenty of food and managed 15-20 miles/day from the start. This whole area is stunningly beautiful and worth hiking every step. If I did it again I'd set up camp ~5 miles north of Holman and hike up to the border and back with a day pack. PCT access via the East Bank Trailhead along the Pacific Northwest/Devils Dome Trail to Holman Pass. I don't think the climb is actually 10,200' per Google's elevation profile, but it's a climb. Another possibility via the East Bank Trailhead is to continue on the East Bank Trail to the Lightening Creek Trail, and then up the Three Fools Creek Trail. This 36 mile route brings you to Castle Pass, only 3.7 miles from the Northern Terminus. However, I was advised at the Marblemount Ranger Station that the PNWT/Devil's Dome was the best maintained trail connecting to the PCT from the west and the others may be impassable, especially early in the season. I did hear of a couple hikers trying to go up other trails and having to turn around. The most popular starting point seemed to be via the east side at Hart's Pass. The appeal is you may be able to get a ride to the trail if the road is not closed. There are many hiker friendly people in the Mazama area, so getting a ride is probably easier than you think. However, the road is often closed into July due to snow and/or landslides, and everyone I met walked the last 9 miles. Hart's Pass is 30.6 miles south of the northern terminus, so would be a longer up and back to the terminus, but a beautiful stretch to hike twice. The route from Mazama to Hart's Pass. A fourth option is to start in Manning Park and hike illegally, as it currently stands, into the U.S. This doesn't seem worth the risk, as getting to the East Bank Trailhead is likely more convenient than getting to Manning Park unless you live in B.C. From Seattle, Manning Park is an additional 70 miles of driving with an international border crossing. Given this section is one of the most beautiful on the trail, covering extra ground isn't such a bad thing. You will almost certainly hit some snow whether you go north or south. For me, most snow was north of Rainy Pass, in Glacier Peak and Goat Rocks above 6,000'. This will vary depending on your timing and the previous winter. The PCTA has links to snow maps to get an idea of how much snow is on the ground. A significant number of down trees and overgrowth made for slow and sometimes dangerous hiking in northern WA. This was one of the bigger challenges on the entire trail for me. I thought Washington had just the right amount of trail company, with a few other southbound hikers and occasional section hikers. The weather was highly variable. I experienced sun and high temps in the 90s the first week, and the rest of the time was mostly cool/cold, though never below freezing, with rain, drizzle and overcast 80% of the time. The rain only came down very hard once, and I dodged a hail storm around Mt Rainier. Mosquitoes were present and biting depending on weather and proximity to lakes. Generally, if the sun came out and near a lake or pond, the mosquitoes were annoying. They were particularly bad around White Pass. There were only a few small patches of snow around Mt. Jefferson. There were some down trees in burn areas and unmaintained sections of trail in south, but generally the trail was clear. 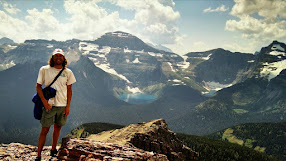 I began to hit the northbound bubble in central OR, crossing paths with 50-100+ hikers per day. I was happy to have company at break points, but the number of people on the trail did get overwhelming at times. The Wilderness areas (Jefferson, Sisters) got a bit crowded on weekends and holidays. The weather was often hot with temps well into the 90s. I saw no rain in OR, and hardly a cloud in the sky. There are a few longer sections without water in southern OR, but sources listed were reliable and of good quality. Mosquitoes got progressively worse out of Cascade Locks, and then largely disappeared south of Crater Lake. They were bad enough in many sections for head net, long pants and long sleeves while hiking. They made enjoying a swim difficult. I encountered my first fire closure, from North rim of Crater Lake to Mazama Village. The trail was generally clear of trees and overgrowth. There were some long stretches of solitude in northern CA. There was plenty of company in the Sierras, especially along the JMT. I had hot temperatures (over 100) passing through Seiad Valley in northern CA, and then my first frost September 8 heading into the Sierras. There was no precipitation north of the Sierras, but I woke up to a coating of snow on Sept 13 and had snow/sleet showers throughout the day. About a week later a cold rain fell for an hour in Kings Canyon. Otherwise, there was no precipitation. There were some chilly temperatures, with highs in the 30s and a couple morning lows well into the teens. There were some longer stretches without water north of the Sierras, but manageable. There was no shortage of water in the Sierras. Water begins to become scarce south of Cottonwood Pass. No trail closures. I heard some people missed a section around Seiad Valley due to fire after I passed through. The trail was generally clear and in good condition. There wasn't much company in this section with the exception of more popular day use areas (Mt Baden Powell, Mt. San Jacinto, Mt. Laguna). There is much more frequent town access. Temperatures varied depending on elevation and cold/warm fronts. Below 6,000' was generally hot with temps in 90s and no shade. Above 6,000' was generally cool and comfortable. No freezing temps. I had a few welcomed cloudy days and a couple rain showers, plus one thunderstorm with heavy rain and scary lightening. The lack of water is a challenge in this section. There were few reliable natural water sources. The PCT Water Report was an indispensable tool. Shake Canyon to San Francisquito Canyon Rd. Aqua Dulce to Mill Creek Fire Station. I carried an ice axe and micro-spikes to start, but never used the axe and used the micro-spikes only a few times. I was still glad I brought both. For the most part the snow was soft and I was comfortable with hiking poles and kick-stepping without use of spikes. I shipped the axe & spikes home after Glacier Peak Wilderness, which was a bit premature as I hit some snow in Goat Rocks and Alpine Lakes in the morning hours that was icy and difficult to get safe footing on. I started the trip with a pair of boots for the Washington section, and switched to running shoes in OR. I wish I had never bothered with the boots, as my feet were wet for weeks in Washington and I think running shoes would have done just fine in the snow. The Starter running shoes I used this year were even more durable than the ones I used on the final part of the AT last year. I used 4 pairs and got nearly 700 miles out of the last pair. The first couple pairs I switched out prematurely at 400-500 miles. If I had known their limits I could have gotten away with 3 pairs. At Walker Pass I started carrying a LiteFlex umbrella, which weighs about 6 oz. with the handle cut off. I used it often and was glad to have it as there are long hot stretches with no shade and few water sources. Modified Tarptent Contrail 27 Modification successful. Time for new stakes. Homemade Pack 11.3 Held up well. Homemade Quilt 23.1 20F design, but a little colder than hoped. Required a good fluffing before getting into. Thermarest Neoair Xlite 13 Amazingly durable and comfortable. Clothes 41.3 Varied. I wish I had my down jacket in the Sierras. Sawyer Mini Water Filt 1.3 First one broke. Toothbrush/Paste/First Aid/Sunscreen 3.7 Got rid of the sunscreen after Washington. Maps and Compass 3.2 Only used compass once in Washington. Glad to have the maps. Crocs 6.8 Parted with in the Sierras. I didn't find them to be necessary since my feet were rarely wet. Battery Stick 2.4 Sent home at Stevens Pass. Not needed. Rope/Bag 1.8 Didn't use much in southern CA, as not many trees. Carried 2 lb Bear Vault BV450 bear canister from Sonora Pass to Horseshoe Meadow. No problem fitting enough food in it. Ice Axe 9.9 Good for digging catholes. Sent home at Stevens Pass. MicroSpikes 9.7 Used twice in Glacier Peak Wilderness. Sent home at Stevens. Not surprisingly, food was my single biggest expense. I may have indulged at restaurants a bit much, but did find incredible amounts of food in hiker boxes in OR (northbound bubble) and in the Sierras (JMT hikers over pack). I didn't spend a single night in a hotel, motel, or otherwise pay for sleeping with the exception of a few donations to trail angels. I was very fortunate to have had kind strangers offer me a bed and shower on 4 occasions. The required bear canister and ice axe & micro-spikes added about $150 to gear expenses. The table below accounts for all of my expenses during the 4 months on the trail, including flights to and from the east coast.